​​Thigh pain and heel pain are common injuries experienced by runners. The Department of Physiotherapy at Singapore General Hospital shares some tips to treat these ailments. injuries such as thigh and heel pain can be prevented whether you'​re an amateur or experienced runner. Are you knowledgeable about the symptoms and basic treatment of common running injuries? Whether you’re a beginner or an experienced runner, if you feel pain in your thighs or in your heels, take note of the following pointers offered by Ms Suelyn Chan, Principal Physiotherapist, Department of Physiotherapy, Singapore General Hospital (SGH), a member of the SingHealth group. The iliotibial band is a ligament that runs along the outer thigh from the hip to the knee. ITBS occurs when this ligament thickens and rubs the knee bone, causing inflammation. Long-distance runners are more susceptible to this form of thigh pain. Ice the affected area for 15 min. Stand with your right leg crossed behind your left and lean to the left, keeping your right foot pressed to the floor. You should feel a stretch along the outside of your right leg from the hip to the knee. (Repeat with the left leg). Lie on your left side and lift your right leg above the level of your right hip and bring it behind you to a 30-45 degree angle. Hold for 5-10 sec and repeat 15-30 times. (Repeat with the left leg). This thigh pain is caused by a small muscle tear as a result of sudden movement or overstretching. Lie on your stomach and radually bend your knee to a 90 degree angle, then lower it. Start with 8 to 15 reps three times a week. Repeat the exercise but this time, with the leg raised. Complete 8 to 15 reps, three times a week. 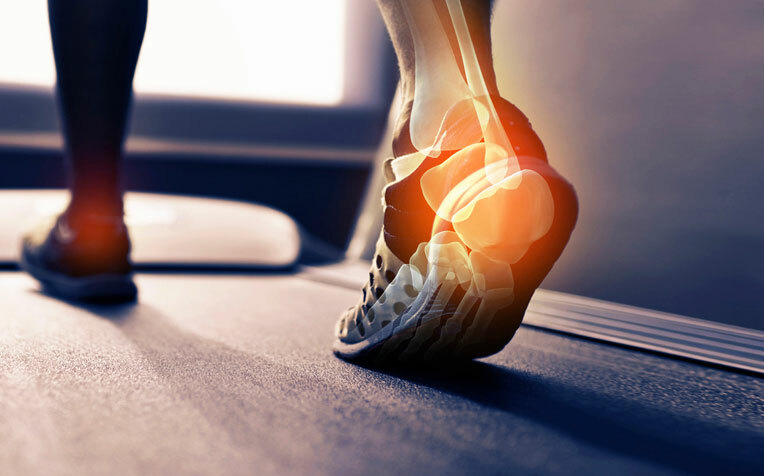 This is when the plantar fascia (the band of tissues connecting the heel to the toes) gets inflamed, torn or overstretched. Ice the affected area and rest. Stand in a stride position one foot in front of the other. Keeping both feet flat on the ground and toes pointing straight forward, bend the forward leg till you feel a stretch in the calf muscle of the back leg. Hold 10-15 sec, repeat 3-5 times. Stand on your toes on the edge of a step. Move your body weight to your injured leg and slowly lower your injured heel while keeping your knee straight. Use your injured leg to rise up on your toes again. Do up to 3 sets of 15 reps and repeat daily for three months. Read on for tips to prevent injuries from running. Previous page: Find out how to treat knee pain and shin splints.